Old Market Square, by Gustafson Porter, in Nottingham, England. 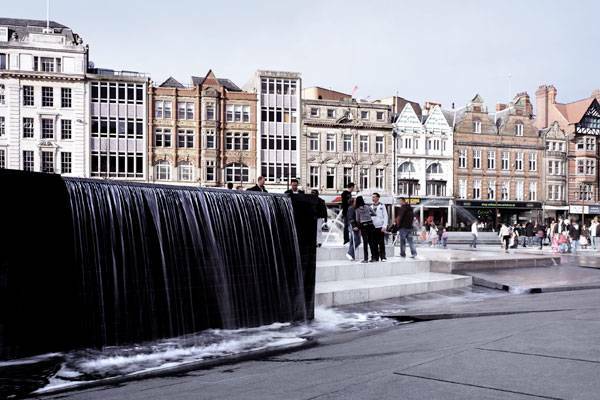 In 2004, the Development Department of Nottingham, England, organized an international competition for the re-design of the Old Market Square. 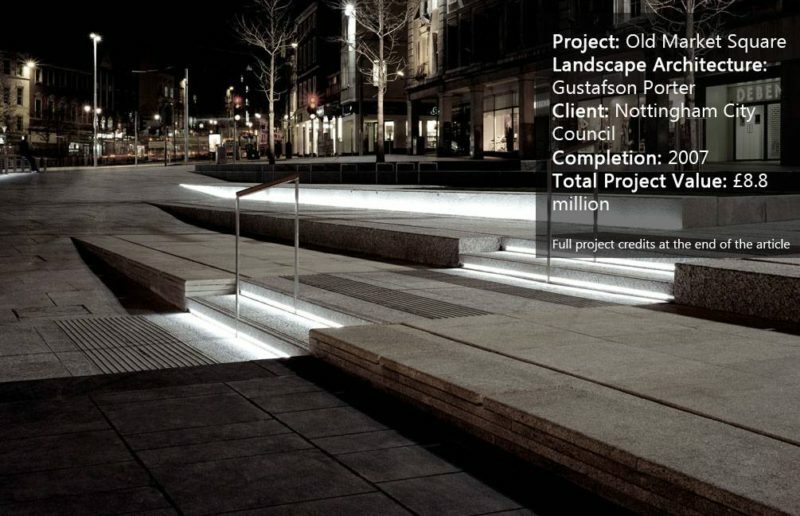 The winners were Gustafson Porter and Bowman, and the design was so clever that the Old Market Square of Nottingham became the nerve center of the city’s social and cultural life. 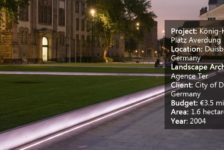 The square holds a strategic location within the city and is connected with spacious avenues and streets that create quick routes across the compact center. 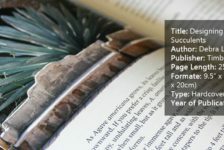 Those avenues and streets are filled with relevant places for citizens and visitors, such as restaurants, libraries, hotels, banks, department stores, and tram stops. In its new role as social catalyst, the square is now home to many community events. During the summer, it transforms into the Riviera Beach, an urban beach setting with bars and different attractions. 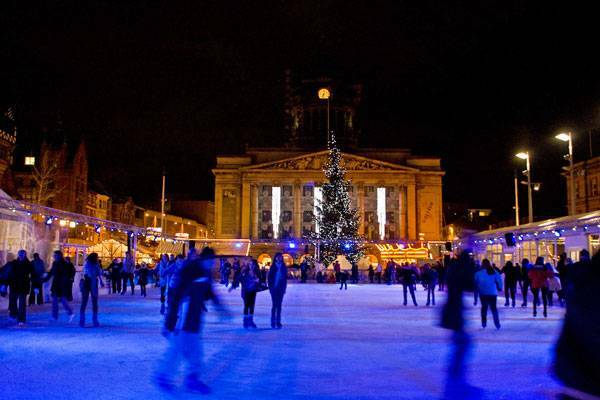 During the winter, the space becomes the Christmas Winter Wonderland, where people can enjoy skating at an ice rink. Throughout the year, visitors can browse farmers markets to easily buy local products. 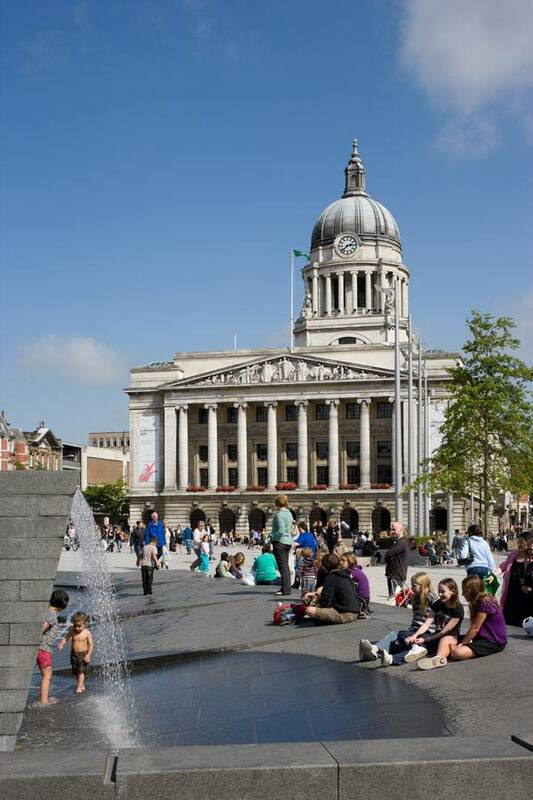 The square has become an important landmark and node for Nottingham’s citizens. It is the second-largest square in the United Kingdom, after London’s Trafalgar Square. 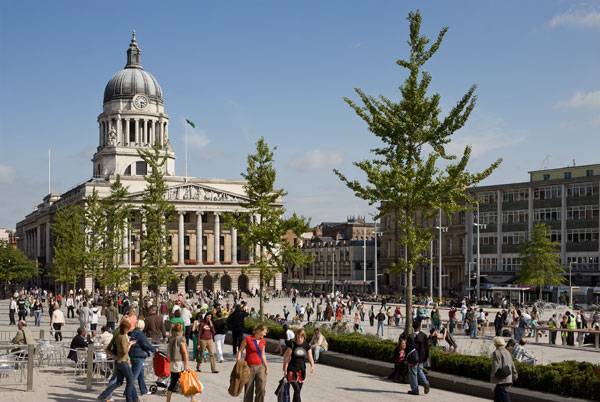 Nottingham’s square is also one of the oldest in the country, with 800 years of history. 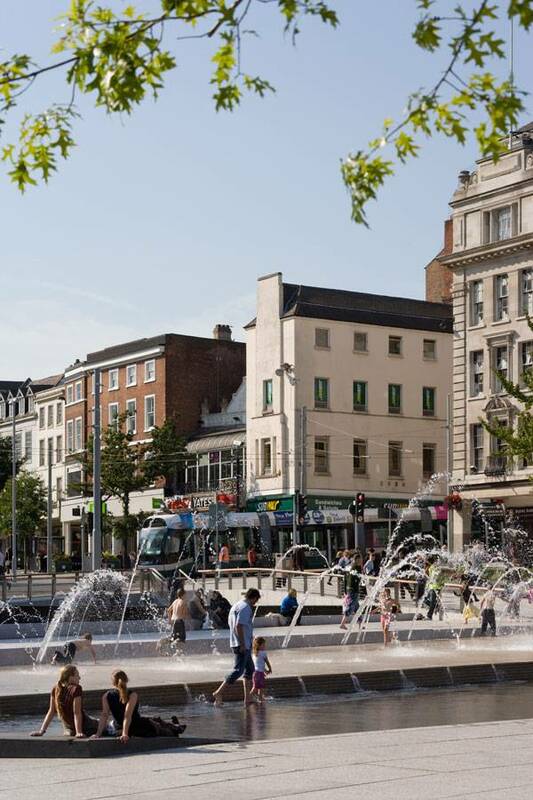 “The project has been well received by the citizens of Nottingham and is well used both in attending events but also using the seating areas to relax and meet. 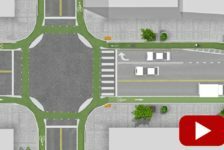 Previous issues associated with antisocial behavior have effectively disappeared with the new design,” said City Council representative Steve Hunt. 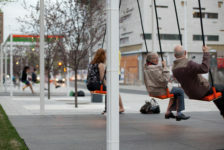 The idea to re-design the square came out of the city’s need to stage cultural and civic events. The previous 1929 design by architect T.C. Howitt — who was also responsible for the design of the contiguous Council House Building — was poorly lighted and created a not-so-welcoming atmosphere, especially during the night. Through various studies, it was determined that 78 percent of pedestrians crossing the square avoided the center of the space, due to the many steps and low walls. The only group that enthusiastically used the space was skateboarders. So when the city’s Development Department organized the competition, its members knew what they wanted in the square and had very specific requests for the competition’s participants. The proposed design had to encourage 24-hour use, integrate street furniture, attract pedestrians, allow access for all, use high-quality materials, create water features, enable perimeter use, and — most importantly — provide a flexible performance space. Summing up, the place had to be innovative and attractive; it needed to be a place for the people. The landscape architects used the natural topography of the original medieval square to guide the design. The different levels of the square played a protagonist’s role in the final result and in the way that the space is now enjoyed. 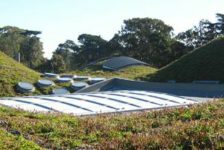 The topography was used as a natural drainage system, with soft, gradual level changes — which also happened to work well for wheelchair users. The 4,400-square-meter water feature contains a reflecting pool, a 1.8-meter-deep waterfall, rills, 53 jets, and a scrim aligned in four terraces. The water can be turned off and the space used as a stage or viewing area when required. Even with the water turned on, the terraces provide seating and contemplation spaces. The terraces each have a different color — gray, black, white, and beige — to delineate the level changes. 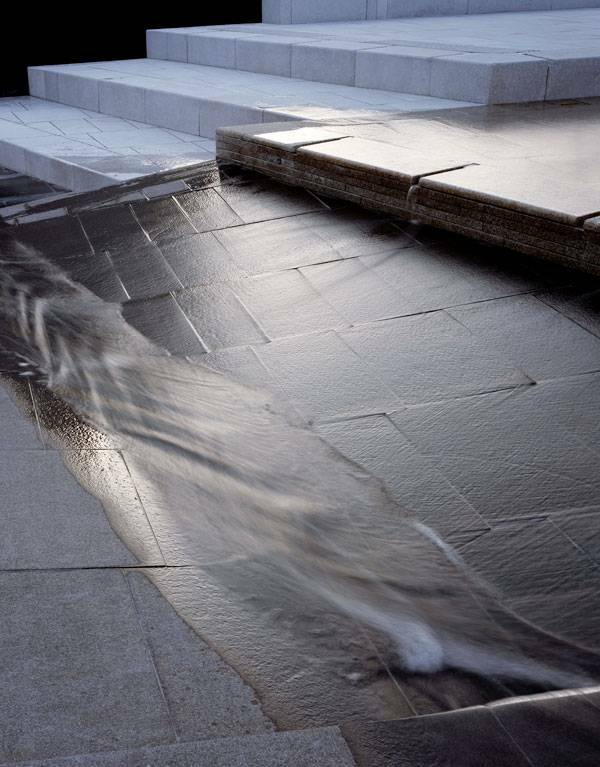 They are made of granite blocks, the predominant material used in the entire square because it provides durability. The colors also aim to reflect the color palette of the surrounding building facades. Planters aligned with box hedges have been placed on the north side, creating intimate spaces that facilitate passive recreation and provide more seating places. This space is the green brushstroke of the design. A frontier between the Long Row and the square is made with a line of Ginkgo Biloba trees; these trees reach 50 to 80 feet or more in height, with a spread of about 30 to 40 feet. The fan-shaped leaves turn a golden-yellow tone during the fall. The box hedges are full of thousands of colorful flower bulbs and perennials, and there are hundreds of shrubs. Toward the south and west, on the South Parade, stand Pin Oak trees that reach 75 feet tall with a 40-foot spread. Their leaves turn bright red-brown during the fall. 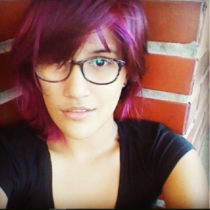 All of this unites and generates a composition of colors and shapes that transform constantly through the different seasons. 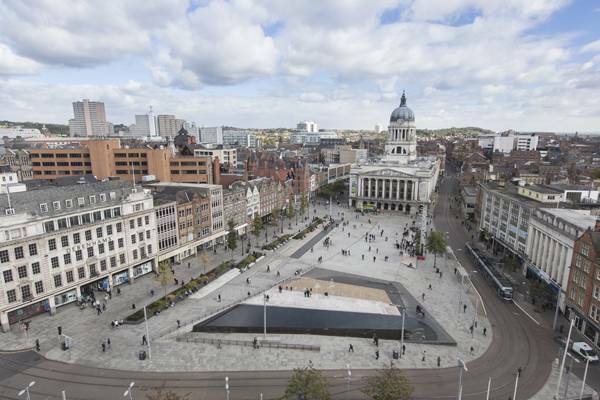 The new Old Market Square of Nottingham is a place for the community, thanks to a well thought out design. Gustafson Porter was able to revitalize a place that was dead and bring it back to life. The square is now an important landmark and node for the citizens, who can now actually enjoy it as the center of social and cultural life in the city. 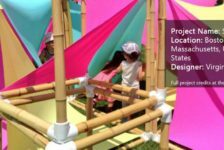 This project is one of the most tangible demonstrations of why good quality public spaces are vital in making a city livable. 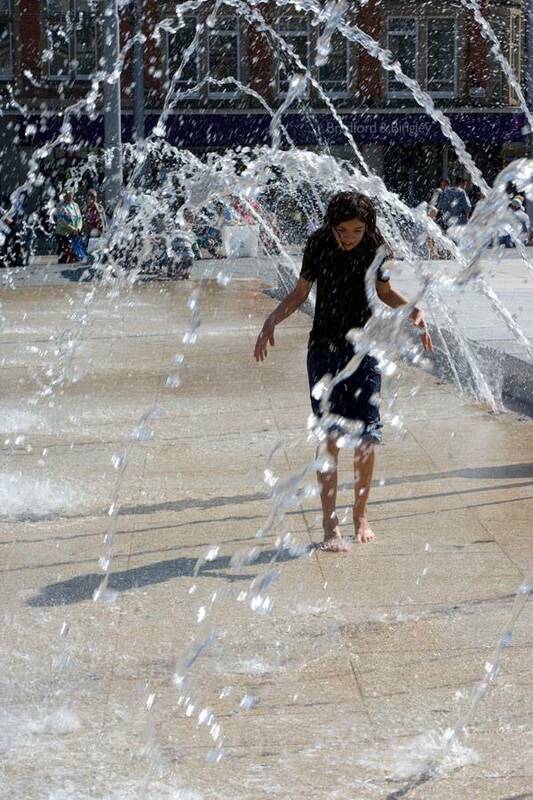 So, do you agree on the relevance of public spaces for a city’s quality of life?